He stood six feet five inches tall with an impressive frame. I liked the soft smile that always lit up his face, even when he was somewhat upset. I had been often told that, when I was three years of age, he used to tease me with his bristly mustache and beard. “Mais ca pique,” (but it prickles) I used to whisper in my mum’s ear every single time I was asked to kiss him good bye. Since I was the only petite-fille (grand-daughter) he had, I was also his little chouchou. My grand-father was a man that loved the land, la terre. After all, he was a farmer, and this is probably from him that I have drawn my love for nature. With him, I have learned to enjoy the smell of hay on a warm breathy summery day, the sound of autumn leaves rustling under our feet when we strolled in the forest during autumn, or the exhilarating feeling of returning home with our boots covered with dirt, after walking for long hours in rain-drenched fields. My grand-mother would then always tell us off when she saw us come back filthy, with his two short Teckel dogs following; we would smile when she had her back turned, amused and feeling complicit. My grand-father’s name was Henri and he was my father’s dad. “Il faut que vous veniez cueillir les pommes,” (you have to come to pick the apples) he used to tell us when, every year by early September, his Reine des Reinette apple trees were full of ripe fruit. They were not the most beautiful looking apples in his orchard, but he was extremely protective of them. I quickly grew as fond of them as he was. These apples were special indeed: they meant homemade tarts and compotes which my mum would bake during many afternoons, or slices of the raw fruit which we would add to fromage blanc with raisins, giving us enough good excuses to drive the short ten kilometers between my parents’ house and the village where my grand-parents owned their farm and large verger (orchard). The last time I ate reine des reinette was at my brother’s house in October. Remember? During a whole weekend, he kept bugging my sister-in-law and I to pick the apples. “Venez, il faut les cueillir, elles vont pourrir sinon” (come to pick them, otherwise they will start rotting) he insisted. Was he really asking like my grand-father H. used to? We laughed a lot at the thought, shouting back “plus tard” (later) from the back garden where she and I were lazily lying in long chairs. But truth being said, since I do not have many opportunities to eat this apple variety anymore, I was quite thrilled to help him with the chore. La reine des Reinette is indeed a real queen. Although reines des Reinette are common apples in France, this is not the case in the United States, at least to my knowledge. But recently, luck was on my side. A few weeks ago, when Bonnie B. emailed me to ask whether I would be interested in attending a special Heirloom Apple event held in Boston, my curiosity was picked. I could not miss this! But unfortunately, the event happened while I was at the food styling workshop in L.A. At first, I felt bummed. So I pondered, trying to find a way, and soon enough, an idea crossed my mind. I emailed Bonnie back. 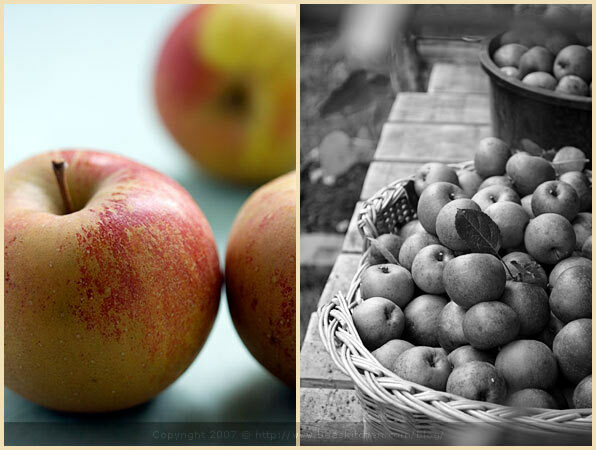 ** Heirloom apples are usually defined as those in cultivation for 100 or more years. Sometimes considered less pretty by modern standards, they are however much tastier than new varieties. They are truly unique. With a smooth, shiny outer skin, the reine des reinette is the best apple within the Reinette family. Its color ranges from gold yellow, when the fruit is mature, to orange red, which is the sign of longer exposure to the sun. Its white flesh is slightly acid, but deliciously sweet and juicy. Although this apple is excellent eaten raw, it proves even better when cooked and used in stews or tarts. It is typically harvested between September to late October, but keeps for a few months when stored properly in a cold room. In arboreal nomenclature, the word Reinette is a symbol of excellence. It has been used for over 4 centuries; Charles Estienne, who was a horticulturist, was one of the first person to mention it, in 1540. “Où sont les pommes ?” (where are the apples?) I asked P. as soon as I walked in the house last Monday night, just back from the airport. “Elles ont l’air bonnes,” (they look good) he had told me on the phone when I had inquired about them. I was worried that he would forget to pick my Reinette apples. They were just as I remembered. It was my first time seeing reine des reinette in the United States. It felt cozy and familiar, and nicely strange as well. For a second, I almost forgot where I was. A first time is always peculiar. I ate the first one raw, taking my time to savor every bite of the juicy flesh. Deep inside, I was already hoping that my two bags would last me for ever. And the next day, I decided to bake a cake. I made it simple: I wanted the taste of the apples to stand out. While it stayed moist, this cake somewhat resembled a thick apple crêpe. Do not expect a high risen cake, or you might be disappointed. Instead, imagine layers of apples wrapped in a cooked light, sweet batter. I used quinoa and brown rice, making the cake gluten-free, but should you have difficulty finding these flours, white flour would work as fine. “Y’a encore du gâteau que tu as fait hier ? J’ai un petit creux.” (Is there still some of the cake you made yesterday? I feel like a nibble.) P. asked me. There wasn’t any more cake. Of course not! But since I felt as keen as P. to have the taste of the apples again, I did not need him to twist my arm to bake another cake. La reine des reinette is my queen apple, after all. Just as much as it is for both my grand-father and brother who, I am convinced, would have enjoyed a taste of the cake too. They both know that la reine des reinette never disappoints, and cannot wait. Sift the flours with the baking powder and keep on the side. Break the eggs in a large bowl and beat them with the sugar and fleur de sel, until light. Add the melted butter and the rest of dry ingredients. Mix well but not for too long, until everything is incorporated. Top evenly with the cranberries. Cook in the oven for 30 to 35 min. Remove and let cool for a few min before unmolding on a large plate. Eat it lukewarm, it is even better. *Remplacez par de la farine blanche si vous ne pouvez pas trouver ces farines. Tamisez les farines et la levure, et mettez de côté. Faites tremper les canneberges dans de l’eau chaude pendant 20 min. Filtrez. Pendant ce temps, pelez les pommes, évidez-les et coupez-les en tranches fines. Cassez les oeufs dans une jatte et battez-les avec le sucre et la fleur de sel jusqu’à ce que la préparation soit aérée et légère. Ajoutez le beurre fondu, puis le reste des ingrédients secs. Mélangez à peine, pour que tout soit incorporé. Ajoutez les tranches de pommes. Beurrez un moule à manqué de 24 cm de diamètre et versez-y le mélange de pâte/pommes. Répartissez les canneberges sur la pâte. Cuisez au four pendant environ 30 à 35 min. Sortez du four et laissez reposer quelques minutes avant de démouler. Mangez-le tiède, il est encore meilleur. 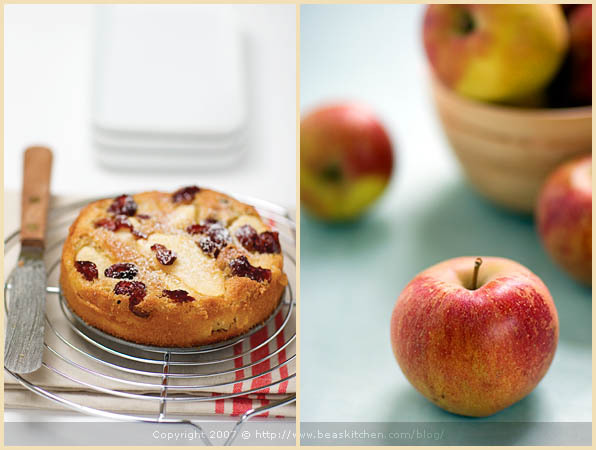 Jealous of your appless…and the lovely cake you made with them. You are an angel for posting these amazing, gorgeous looking recipes for gluten-free goodies! I will add this to the next Gluten-Free Roundup, for sure. un gâteau avec une pomme qui porte un nom digne d’un conte de fée ne peut donner qu’un gâteau magique et plein de saveurs… et voici toute la poésie de la cuisine. That’s one gorgeous little cake Bea. J’adoooore les reinettes. Bea, I always love your stories. I will have to look for heirloom apples now as I’m sure they will sweep the country. I remember discovering Pink Ladys in Seattle several years ago. I would swear that was the apple tree in my grandmother’s yard 50 year ago. As you say “cozy and familiar, and nicely strange as well.” Love the photo in the little spring form pan. As usual, your post made me dream… I loved that story! One of my favorite apples is the French “Boscoop”. Gorgeous! Your cake looks truely wonderful! What a beautifull post. It made me a little child and granddaughter again. 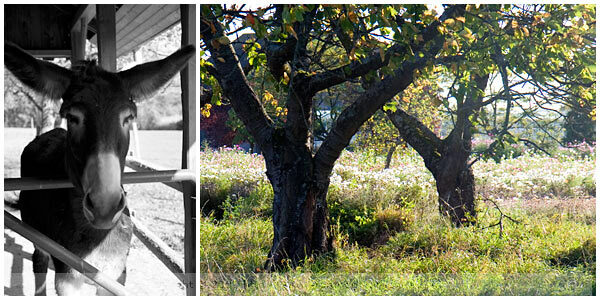 My Grandparents had a little garden with a very special apple tree with perfect apples. And I missed their taste for years untill I found a market place here in Berlin last year where farmers are selling old and rare sorts of old apples in their season and found my childhood-apple again. Wonderful post and memories about your grandfather. The cake looks wonderful– very like a recipe I have for an apple cake that incorporates ricotta or cottage cheese and is also quite flat and rustic. You’ve inspired me to make it again. Are the cranberries the dried ones? What a lovely post. Isn’t the connection between food and memory strange but wonderful? And I’m glad to see this recipe is gluten free — I will pass it along to my mother, who has celiac! Je n’avais aucune idee que ces pommes, si communes ici, pouvaient etre considerees comme pommes du patrimoine aux Etats-Unis. C’est vrai qu’elles sont jolies, tout autant que ton histoire – et que ce gateau tres tentant. Vraiment, j’adore ce gâteau et je le garde en réserve, surtout qu’il est déjà sans gluten. Nul besoin d’adapter la recette. Beautiful writing, Bea! Probably the best so far. The opening was such a great catch. Now, let me ask: quinoa flour and brown rice flour, is that really rare or would the odds be pretty good to find them in the store? Perhaps my little special organic store that sells all sorts of flour in bulk. I just love your apple cake… it looks so good! What a lovely cake! I am enjoying the apples (yes, I am getting those here in the Vendee) with yogurt for lunch almost every day. The ARE delicious! 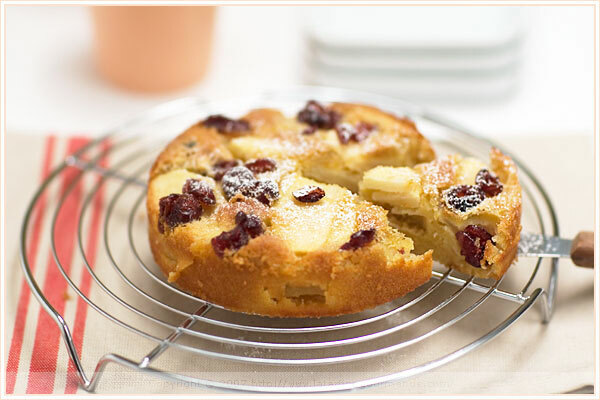 What a beautiful apple and cranberry cake! Two of my favorite foods this time of year. Béatrice…Je te chipe ta recette…Rien que de voir la photo…hummm j’en deviens gourmande de plaisir…En plus dimanche,on a fait la cueillette des pommes dans un verger. Beautiful apples! The cake looks magnificent aswell…just what I would love to eat with a nice big cup of latte. Those are the “less pretty” apples? They look pretty good to me. et voila que je descends au marche ds qq minutes… ta recette me donne envie ! Bonne journee a toi ! I’ve been mad about cranberries lately, but I haven’t done much with apples. This is such a nice, simple cake. I can think of many occasions when such a recipe would be just perfect. Heirloom apples must be such a treat! 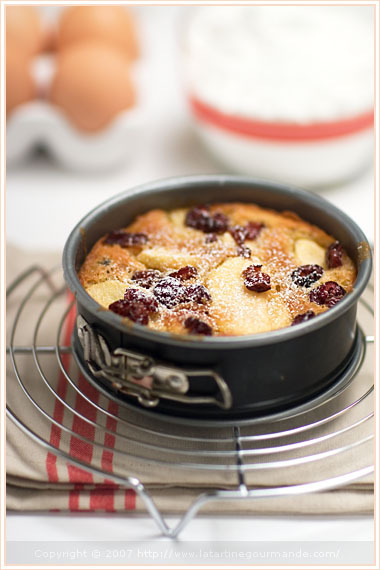 What a great use of fall’s best fruits – apples and cranberries. Gorgeous, Bea. Your blog is one of my favorite, favorites ever. Thanks for always posting such beautiful things. What I loved about this cake, having had the great fortune to taste it, is that the lightness of the cake allowed the flavor of the apples to truly shine. Wonderful! 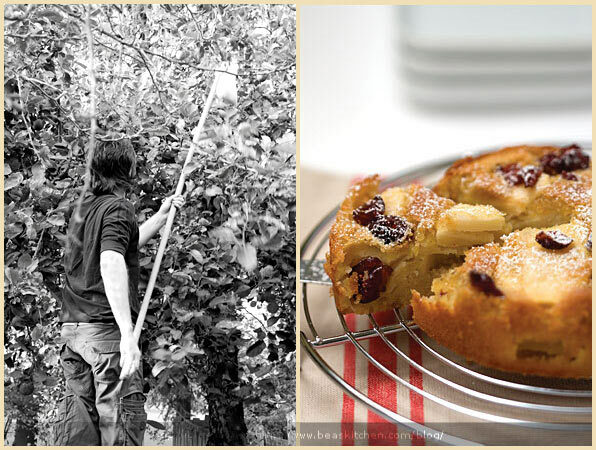 What a great story and a beautiful recipe and cake to illustrate it. I love Reinettes…they bake beautiful and are very fragrant. You make me nostalgic for the little uggly apples our tree would give. Tart but with the flavor of quinces. Love the use of gf flours! I just had to tell you, I made this cake the minute I saw the pictures and I absolutely loved it! I used Honeycrisp apples as I didn’t have Reines des Reinettes and it turned out great. Thanks so much for posting this recipe and as always such beautiful pictures! Love the pic and looks yummy!!! What a gorgeous looking cake! I loved your story about your grandfather’s apples, particularly as my gran used to have an apple tree in her garden as well (I’m now reminisicing over how we used to go and and pick them when we were little). Ah la Reine de Reinettes !!! Une de mes pommes préférée !! Merci pour cette magnifique recette que je m’empresse d’imprimer ! Thank you all for your comments. I hope that you will be able to taste these apples one day indeed, if you have not so far. They are really delicious. I also asked Bonnie where to find them in New England, so should you be interested, drop me a line! je découvre votre blog!! 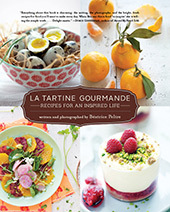 !j’adore vos photos , textes et recettes!!!!BRAVO ! Looks absolutely delicious! My mother brought back some Reinette Grise du Canada from Montreal when she went there. They were very good. Oh, that’s BEAUTIFUL. I was actually on my way to the store to buy apples to make an apple crisp, but I think I might have to change my plans. Thank you for the recipe and gorgeous photos! Maureen, you do not need a spring form mold. I did it once with one, and the other time without. Flip it then carefully on a plate with the help of another plate placed on top. Sorry, not typically a baker, so does that mean I can just use a 9″ cake pan? Thanks Bea – much appreciate you replying. Your blog is unbelievably beautiful. I am addicted to it. 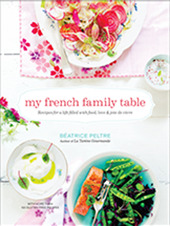 I love your writing, the photographs and your recipes. Thank you for all your great work! Am serving it with vanilla ice cream. It smells so good. Thank you once again Bea for sharing your wonderful recettes! This is the best cake I have ever made. I doubled the recipe to use my large springform pan. So moist and delicious. Thank you for sharing your kitchen wisdom. Geography matters! Tell us about the conditions of soil, rain, temperature, insecticide used or permitted, Would they grow in Vancouver Island, BC? Long Beach Penninsular? Southwestern WA? it is in the rain forest. Reinnette apple Receipe for fish and seafood? What a beautiful story to accompany that beautiful apple. I’ve been picking some of my favorites in the orchard, Bramley, Calville Blanc and Belle de Boskoop. Perhaps they would like some new company in Reine des Reinette come planting time. Merci! Nous avons trouve une Reine de Reinette here in the gold country of California, planted during the gold rush and imported by Felix Gillet in the late 1890’s. Whoopie! What a great site! and I love your recipe for the gluten free cake, I’m going to make one this week. Merci beaucoups! What a great blog. I am researching heirloom fruit trees that were imported into California during the Gold Rush by Felix Gillet in the late 1800’s. The Reine de Reinette was one of them. Thank you for this lovely article and recipe. I may have found one of these old trees and am going to make your gateau. Really delicious cake. I made it with Asian pears in a 9″ springform pan. Next time I would probably use parchment paper on the bottom of the pan. And there will be a next time!